Since 1982, Bryans Gallery has represented exceptional artistry of the Southwest and the Eight Northern Pueblos. We have estate and contemporary paintings, sculpture, jewelry, pottery, rugs and baskets. Some of the finest rare examples of Southwestern American Indian arts and craft can be found in our gallery, a brick and mortar building at 121 Kit Carson Road in Taos, New Mexico. Our staff is knowledgeable and friendly. 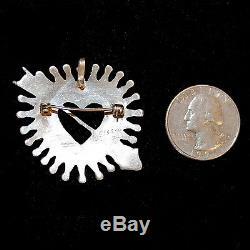 Beautifully crafted sterling silver and turquoise Zuni needle point pendant / pin heart with arrow; signed Etsate. It can be worn as a pendant or a pin. Each tiny turquoise stone has been hand-cut and hand-set. Approximately 1 1/2" x 1 3/8", 8.5 grams. 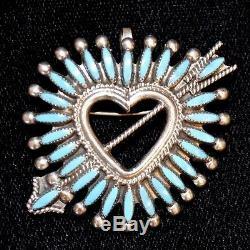 The item "Sterling Silver & Turquoise Zuni Needle Point Heart & Arrow Pendant/Pin, 1.375" is in sale since Monday, August 17, 2015. This item is in the category "Jewelry & Watches\Ethnic, Regional & Tribal\Native American\Necklaces & Pendants". The seller is "mbsteger" and is located in Taos, New Mexico. This item can be shipped to United States, Canada, United Kingdom, Denmark, Romania, Slovakia, Bulgaria, Czech republic, Finland, Hungary, Latvia, Lithuania, Malta, Estonia, Australia, Greece, Portugal, Cyprus, Slovenia, Japan, China, Sweden, South Korea, Indonesia, Taiwan, Thailand, Belgium, France, Hong Kong, Ireland, Netherlands, Poland, Spain, Italy, Germany, Austria, Russian federation, Israel, Mexico, New Zealand, Philippines, Singapore, Norway, Saudi arabia, United arab emirates, Qatar, Kuwait, Bahrain, Croatia, Malaysia, Chile, Colombia, Costa rica.